At Tone 7 we’ve completed our climb of Spiritual Growth and stand in the place of Balance at the top of the pyramid. Our effort was invested in an Intention to bring both sides of our Self together into Atonement with the Creator. When our Lower Self and Higher Self operate together in the integrity of their Divine Purpose, we Atoned as One in a Sacred Trinity. Our Lower Self offers our initial Emotional Response to life experience. Our Higher Self sees through the illusion of our Shadow to draw the Truth of Divine Discernment. There is no need to suffer in the fear of our illusion, when we know we can turn to a Higher Perspective. Our Higher Self is our Channel to the Creator, that would always offer the Discernment of Higher Purpose and the Creator’s Power to transform every experience by Divine Justice. Crocodile/IMIX is the symbol of Birth and a new Dawning. IMIX represents the Divine Feminine, the Compassionate Love of a Mother who would sacrifice herself to the duty of raising us up. Like a newborn, we are opening our eyes for the first time to see the Truth from a new Understanding. Given a Higher Consciousness to Discern the Voice of the Creator, our final 20-day journey with each of the Day Signs will lead us to the Revelation of our own Transformation. PORTAL DAYS: Element of Ether – Portal days thin the veil to Spiritual Dimensions. Portals magnify our Spiritual Gifts of Intuition and Divine Discernment. As we stand in the balance, 7 Crocodile/IMIX a Portal magnifies our reflection on what we have accomplished through our process of Spiritual Growth. Through our Intuition, we may hold a Sense of Anticipation for a new Spiritual Awakening. We enter the 13th Uinal of Ascension, the final 20-day cycle of the Tzolk’in round. Through an Ascension, we are Transformed in the way we See our Self. We recognize our own change as a result of our Relationship with the Creator. We are made capable to Acknowledge the Truth of Higher Ground. 13 is the number of theurgy, the ability to draw Divine Agency to Human affairs through the practice of Ritual and Sacred Ceremony. Our Sacred Rituals mark a time and place when we see to be One in Consciousness with the Creator. A portal is open that would magnify this experience. IMIX is the Day Sign that initiates every Uinal with a New Inspiration. Sun/AHAU is the Day Sign that Completes an Intention of Understanding. Sun/AHAU and Crocodile/IMIX illustrate the Alpha and Omega, the Divine Feminine and the Divine Masculine, the Beginning and the End. AHAU is the Divine Masculine that represents the Hero that inspires an application of our own Will. IMIX is the Divine Mother that nurtures our Dreams. IMIX is known as the Day Sign of innovation. We can be inspired by something we’ve never thought of before. IMIX encourages us to use our Higher Mind. Our Lower Mind is the calculator, the source of Reasoning that puts all the facts together. Our Higher Mind is the Source of our Unlimited Thinking, engaged through our imagination. As a mother would encourage us to see all that we could become, IMIX shows us that we are only limited by what we are able to imagine. We are reminded that every Dream is a Divine Offering of Inspiration from the Creator. As something from Above is offered Below, as Human we are given the Freedom to Express the Dream in our own Way. There are many ways to accomplish the same thing. As every Human is different from another, the same inspiration, the same idea, can manifest itself into an unlimited variety of Creations. Through Human, the Creator can experience its own Unlimited Potential of Being. Tone 7 offers us a Gift of Reflection. From a Higher Vantage Point, we are able to see our own Spiritual Growth in every direction. We can see our own change reflected in our Discernment of a Divine Communion (East), how our change would influence the way we engage in our Relationships (South), the way we live our daily lives (West), and the Wisdom we would draw from our own Experience (North). 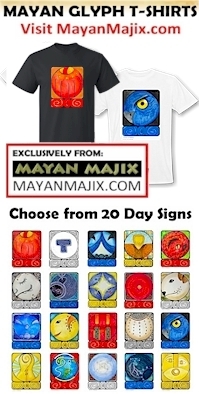 The Cherokee Day Sign, Dragon, represents a Force of Nature that allows us to “see clearly.” The totem Dragon, is said to hold the energy to understand all things Sacred. Dragon carries the Source Energy of Life, and the Energy of Creation that connects our Vision to understand life’s mysteries, and to engage the Power of this Wisdom. To all my relations, as we are initiated into a process of Ascension, we are Reborn into a New Way of Being. Today holds an Awakening of new and Higher Dreams. May we open our eyes to acknowledge their Source as the Creator. May we see the Truth that all our Dreams are Divinely inspired. IMIX encourages us to use Tone 7’s Gift of Reflection to Dream of a Future made possible by our new Divine Consciousness. The role of the Divine Feminine is Discernment. In perfect balance, our Will and Intention can be perfectly aligned with every Dream. Today, we are guided to look beyond the bounds of Reason to Dream and Imagine. This is our First and Direct Correspondence with the Creator. As a Portal magnifies our Discernment of a Divine Presence in our Lives, may we be present to follow the Consciousness of the Creator to imagine the Dreams we would be inspired to Create. As we Acknowledge the Source of our Dreams, from a Higher Consciousness we can know the Truth of their Power to Come True. Cherokee Turtle/ DAK’SI I’SB: Symbol, Turtle Island. Direction East. The Turtle Constellation Orion, one of three stars in the Cosmic Egg. In Mayan this is the Cosmic Hearth. Energy of Creative force at the one-on-one, personal level; dawn, awakening, birth. The beginning of each new era, this star in Orion appears with the rising Sun, heralding the creation of a new World cycle. TOTEM Imix/Dragon – Energy to understand all things sacred. Creation energy, connection for visions to learn the mysteries of the Universal knowledge. The dragon carries the source energy of life, revered in ancient cultures for power and wisdom.